Geniet van de rust en ontspanning van een nieuw gebouwde, traditionele stijl Portugese villa. Deze 2 slaapkamers woning met 1 en-suite en een verdere familie badkamer biedt een prachtig uitzicht over een kurk en eucalyptus beboste vallei. De open lounge / eetkamer heeft een prachtig gewelfd houten plafond, een houtkachel voor de koelere avonden en comfortabele moderne meubels. Het profiteert ook van satelliet TV, DVD en CD-speler, met een uitgebreide bibliotheek van muziek, films en boeken. Een goed ingerichte moderne keuken leidt uit de eetkamer, bestaande uit vaatwasser, koelkast met vriesvak, magnetron, wasmachine en 4-pits pits gasfornuis en oven. De keuken is volledig uitgerust met alle benodigde servies en apparatuur. Extern zijn er 2 patio gebieden leidt tot een zwembad en aangelegde tuinen, er is voldoende parkeergelegenheid voor 2 voertuigen. De en-suite is uit de master bedroom. Overall nice and peaceful place that needs some TLC. Nice and peaceful location. Great bbq, amazing garden and swimmingpool. Tenniscourt is around the corner which is nice when you like to play; it also attracts other guests which can get noisy when trying to enjoy your siesta in your backyard. Overall house is ok, although it is in need of some sustainable fixes. Dishwasher has got rust inside. Both bathrooms are a bit smelly due to faulty sewage (?). In the kitchen (great fridge) we only missed a proper sized frying pan; the 7" version was not big enough for preparing a four person dish. Wifi is available, however the signal is not very stable. Could have to do with increasing usage of wifi devices by guests of the complex. With a bit of TLC though, this house has got full potential to get our four star rating again. Thank you for your feedback, we were pleased that you enjoyed our garden swimming pool and the use of the BBQ however we regret that you experienced some level of disappointment with the internet connectivity, frying pan and the odour issues in the bathrooms. Firstly can I apologise for any inconvenience this caused as it should have been resolved immediately by the site management team, however in their defence things like the odour issues did actually take some engineering works to resolve. I can confirm all of these points have been addressed. Um sítio perfeito. Uma estadia perfeita. Fizemos a reserva com a expectativa de apanhar uns dias de sol no final de Abril- principio de Maio. Gostámos das fotos e dia comentários por isso arriscámos. Não poderíamos estar mais contentes, não existe uma simples crítica a fazer. A casa e o seu redor são perfeitos, bem equipados e existe requinte e cuidado em todos os pormenores. Apesar do tempo não ter sido o melhor, foi uma semana muito feliz. A casa está perto de várias localidades, por isso dá para passear bastante. Estou grávida e para mim foi um descanso... já pensamos voltar para o ano, desta vez com mais um. 😊� PERFEITO! Great place, peaceful and had all the commodities you would need. The owner is very nice. 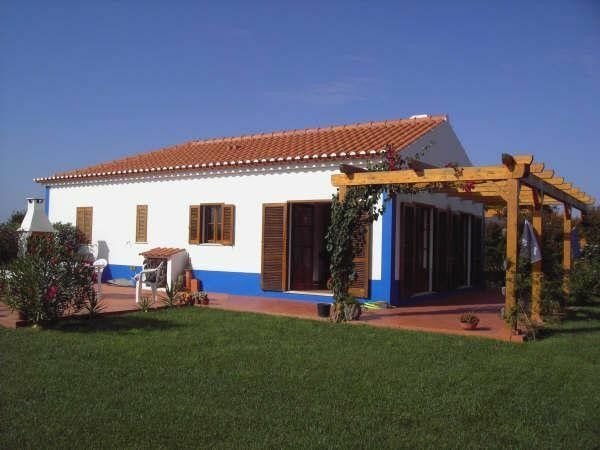 20 minutes drive from the beach at Zambujeira do Mar, and 5 minutes to a Lidl. We were five: me, my wife, our 2 children and my mother, the house was big enough for us. In the first two mornings two lost sheep visited us. I don´t know if it was included, but it was a nice extra. We have no words for the lawn, and it´s heavenly shades. Recommendations: Bring some mosquito repellents, or citronella candles, there aren´t many but it only takes one. A great family holiday - highly recommend. We had a lovely holiday at this villa last August. The villa description is spot on. We had lunch outside on the terrace every day - there is a gazebo for shade which isn't on the photo. The shared pool is plenty big enough and not over busy - my children often had it to themselves. Great place to while away the hours reading and truly relaxing. There are so many great beaches to explore within a short drive so a car is necessary. We enjoyed it so much that we have already booked again for August 2014. This apartment provided exact balance we were looking for in our late summer getaway! Generously sized apartment with all the mod cons you need. Freshly furnished, high wooden beam ceilings, two opening veranda doors in living area,two separate bathrooms, fully provided kitchen meant the time we spent indoors was more than confortable. We however we spent most our time outside. A large enclosed garden was great for the children to play and also explore the surrounding area with our peace of mind. A big fixed barbecue was provided, with seating area catching the sun until sunset over the valley,great for family entertainment at end of day. Large swimming pool at end of garden with lounging area all around, surrounded by a well looked after and pretty green area. Also took advantage of the open tennis court, bouls area and was particularly impressed with the amount of additional equipment and extras found in apartment including tennis racquets/balls, snorking sets/flippers, footballs, bat & ball sets, additional sun umbrella's, huge dvd & book selection aswell as a descriptive local area guide book and maps. Great area to explore, car needed! Local beaches differ from tranquil and deserted to pretty coves with cafes and restaurants. Shopping at Odemeira reccomended, good surf along whole coast. Highly recommended, photo's dont do size and quality justice - will be booking next year! Gelegen in een prachtige ongerepte landelijke omgeving, de villa is op zijn eigen grote hoekperceel met vrij uitzicht op de beboste vallei, beplant met kurkeiken, wilde bloemen en eucalyptus, die beschikbaar is om te verkennen is. De plaatselijke gemeente Odemira ligt op slechts 3 kilometer, en heeft vele lokale cafés, restaurants en een scala aan winkels. Diverse grote supermarkten zijn binnen 5 minuten van het pand. De stranden zijn slechts 10 kilometer naar het westen, waar er vele mooie zanderige baaien en lange stukken van de prachtige kustlijn. Reizen door deze prachtige platteland kan brengen een echt plezierige ervaringen. Rustige wegen naar de lokale restaurants gespecialiseerd in verse vis en zwart varkensvlees zijn te vinden in elk dorp. During high season - July and August the changeover days are Saturdays. Outside these times we can be more flexible.